Bryn Aven, unjustly charged with murder and treason, is on the run. The one person who can help is her greatest enemy, the enigmatic Konstantin Black. Konstantin is her only ally against those who have taken over her kingdom and threaten to destroy everything she holds dear. But can she trust him? The Kanin empire is on the verge of destruction as an oppression settles over the wintery landscape. Bryn has been accused of murder, now on the run and leaving her friends and family behind, including Ridley who is now being tortured in her absence. Disgraced and with no where to turn, her only support will come in the form of Konstantin, a former Kanin guard who has been exiled and working with Viktor Dalig, a rogue enemy of the empire. Hoping to gather support from neighbouring tribes is proving fruitless, until the Kanin Queen declares war against the Skojare kingdom, claiming Viktor Dalig was framed by both Bryn and Konstantin. Queen Mina is bloodthirsty and ruthless, her reign of oppression and greed will only come to an end with her execution. But first Bryn must make it to the palace alive. Bryn must rally her allies, including Konstantin who she's reluctant to trust, especially after his attempt on her father's life. War is being brought to their doorstep with friends enlisted to fight an enemy under false pretenses. This war isn't about clearing her name, but fighting for the Kanin freedom against a woman who plans to take it all. Crystal Kingdom was a worthy and brilliant series end. 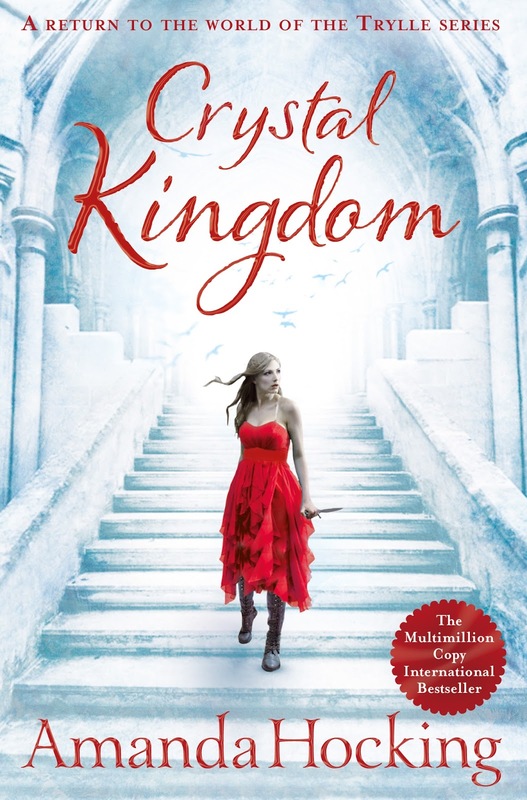 Amanda Hocking transports us back to the wintery kingdom of the Kanin trolls and the tyrannical rule of Queen Mina, this time Bryn is on the run and accused of murder, a crime that fellow fugitive Konstantin knows all too well. Even though she is missing Ridley, her parents and friends, Bryn remains a tower of strength. She has nowhere to go and to avoid capture, she realises that it will take drastic measures to clear her name, but knows she'll never be able to return home. Konstantin is now an ally, the dark knight now turning on the rogue Viktor Dalig to seek revenge, revealing his sordid past with Queen Mina herself. I assumed their newly formed and tentative friendship could have been mistaken for a romantic storyline, thankfully Bryn is a character who doesn't easily fall for potential love interests and her thoughts remain almost entirely with Ridley. I loved Konstantin's character. Where in Frostfire and Ice Kissed, he was evasive and played the sinister role of the villain, in Crystal Kingdom this isn't the case. We learn more about who Konstantin is beyond his crimes, and the softer, vulnerable side which will no doubt endear readers to his cause. Once again, the character driven world building is lovely. From the icy conditions of the Kanin, to the watery kingdom of the Skojare. It's described so vividly, so lovingly that it immerses the reader into Kanin realm, allowing you to fully engage with the storyline. This series has been lovely, but I hadn't realised how emotionally invested I was until the final few pages when a few tears escaped. Amanda Hocking's vivid and immersive storytelling are incredible, creating a rich, vibrant and wildly popular series. She sets realistic and relatable characters into fantasy worlds that has crafted an incredibly intense and emotionally charged finale that will surprise, enthrall and delight until the final page. Your current series, Kanin Chronicles is set to release the third and final installment Crystal Kingdom. For those who have yet to pick up the series, what is the biggest misconception about the trolls you've come across in regards to both the Kanin Chronicles and Trylle series? That trolls are short, ugly, and hide under bridges. That’s actually a very recent concept. For a long time, folklore painted trolls much differently. In many places in Europe, trolls are regarded much differently. Many are giants, and some have magical abilities. Your publishing story is remarkable. From successful self published author having sold over a million Kindle books, and with no formal training as a writer. I've read that you were a self made millionaire even before signing your first publishing contract. Do you remember the moment you decided to become an author... And can I borrow ten dollars? I don’t actually ever remember not wanting to be an author. Ever since I was really little, like two or three, I loved telling stories, and as soon as I learned how to write, I was writing stories. It was just something that I always I wanted to do. With what you know now as adult Amanda, what important piece of advice would you give to sixteen year old Amanda? Not to worry so much about what other people think. Most of the time, people aren’t actually thinking about you even, so do what want, have fun, and stop taking everything so seriously. I love sassy and strong heroines and especially within the Kanin Chronicles and Trylle series, you've created them in abundance. What message would you want to instill in your female teen readers through those strong female characters? That you shouldn’t let anybody convince you that you’re not strong or capable, just because you’re a girl. Don’t let anybody deter you from being who you really want to be. As a former self published author, in the early days you were embraced by the book blogging community. Now that you're traditionally published, do you miss that more personable interaction with bloggers and readers? I do still interact with bloggers and readers, but I did have to take a step back because I was getting overwhelmed. I have a lot of anxiety issues, including pretty bad social anxiety, and while online socializing is easier for me, it can still get very taxing, even though I really do enjoy interacting with readers. I start getting paranoid and exhausted, and I have to remind myself to spread it out and take a break from online when I need to. When you're not writing, what can we find Amanda doing in her spare time? I spend most of my free time reading, watching bad movies, playing video games, and hanging out with my friends, family, and my pets. I have three cats and a Golden Retriever, and they keep me pretty busy. With the Kanin Chronicles coming to an end, what can we expect next from Amanda Hocking and are you currently working on anything you can share with us? My next novel is a standalone paranormal romance novel set in the 1980s that follows a travelling sideshow called Freeks. I pitched it as Pretty in Pink meets The Lost Boys (minus the vampires). It should be out sometime in 2016 with my publisher. And lastly and most importantly, if you could only save one... Konstantin or Ridley? 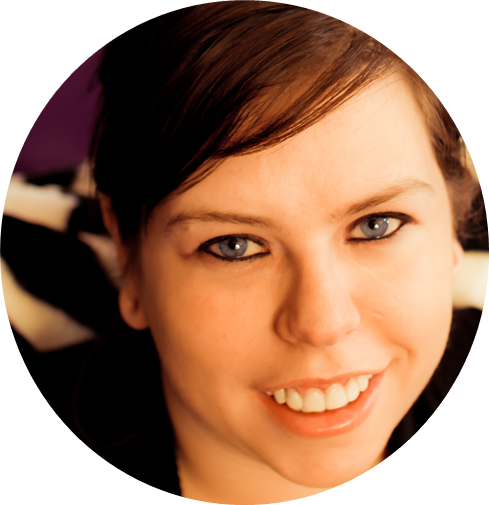 Amanda Hocking is a lifelong Minnesotan obsessed with Batman and Jim Henson. In between watching cooking shows, taking care of her menagerie of pets, and drinking too much Red Bull Zero, she writes young adult urban fantasy and paranormal romance. Her New York Times best selling series the Trylle Trilogy has been optioned for films. She has published fifteen novels, including the Hollows and the Watersong series. Frostfire and Ice Kissed, the first two books in her newest trilogy, The Kanin Chronicles are out now, and the final book Crystal Kingdom will be out August 4th 2015. Before I even was book blogging, I already knew Amanda Hocking's name. Her books were just everywhere on Amazon and I am very happy for her success. She's definitely someone to emulate for us people who wish to break into the publishing world one day despite having no formal training, too - just your love to write and tell stories. Also, I loved the second book of this series and I'm glad to know the book ends in such a promising and satisfactory note! Now come on, St. Martin's Griffin, approve me for this galley already! Haha. Her story is remarkable but it really is due to her hard work and creating such incredible storylines. I'm so excited to start the Trylle series now too. Crystal Kingdom is emotional, so you've been warned Faye. Really looking forward to seeing what you think of it and hope they approve you soon. Oh oh wow...that is an INCREDIBLE publishing journey. 0_0 And I totally understand how even internet socialising can get exhausting. *collapses in a puddle* I CONCUR. I so want to check out this books. LOVED the interview questions, Kelly! Thanks Smushy. She really is an inspiration isn't she. The series is incredible, such kickassery in Bryn and the romance is intensely hot. I think the first time I heard of Amanda Hocking was back when she published the first book of Watersong - her publishing journey is incredible and completely inspirational for those who aspire to publish. I haven't read any other books by her aside from Watering, so Maybe I'll look into this one. Fabulous review and interview, Kelly! Thanks Sophia and I couldn't agree more, she's such a self made success and completely deserving. I think I might pick that book up next, after the Kanin Chronicles, I can't wait to get stuck into her other titles. The cover art for this book is absolutely breath-taking! Gah! Actually, the book covers in this series are gorgeous period. I can't believe that I have had book one on my TBR for almost a year! Truth be told, I wouldn't mind visiting a "wintery kingdom." My summer has been scorching! We reached 116 degrees in my neck of the woods this past week (that would be 46 Celcius)! "Most of the time, people aren’t actually thinking about you even, so do what want, have fun, and stop taking everything so seriously." This is so true on so many levels! At the same time, I often find it is incredibly challenging to wrap our minds around this fact though. Still, it doesn't hurt to continue to echo its importance every so often ;) Such a wonderful review and post overall Kelly! Thanks Claudia, and Amanda was amazing wasn't she and an inspirational success story. Wow, those are some dangerous temperatures, I hope you and the family are able to keep cool. Reminds me of our temperatures here in summer, even our air conditioning struggles to cool the house down. Escaping to a wintery wonderland is just what you need! Thanks for sharing. I haven't read any of these, but it's always cool to hear about an author who had an unconventional means of being published. Glad you liked this one! I've loved the series Lauren and was so emotionally invested in the characters, even more so than I'd realised. I'd love for her to stay within the same world and even explore another tribe in a new series, I can't seem to let this world go. I've never heard of Crystal Kingdom before, but I'll have to add it to the TBR! The world-building sounds well done! When I first read about the ice kingdom concept, Let it Go and Elsa from Frozen immediately connected in my mind. I'm sure the two story-lines are entirely different. I don't think I've read any book set in an ice kingdom, so this will be interesting. Wow! What a great publishing story! A definite success story if I've ever heard one. The series really is incredible Claire, definitely been one of my favourite finales as well. When I started book one months ago, I think I may have read the first few chapters humming Let It Go as well. The world building is really vivid and would love to see what you think of it. Me too Sarah, she's amazing and knows how to lure readers into her worlds. I'm really looking forward to starting the Trylle Trilogy now, having bought the series after loving the Kanin Chronicles. Really looking forward to seeing what you think of it. And the covers are really lovely! It's an incredible series Blessie, and that's saying a lot seeing I'm not a big fan of fantasy. Really engaging too.